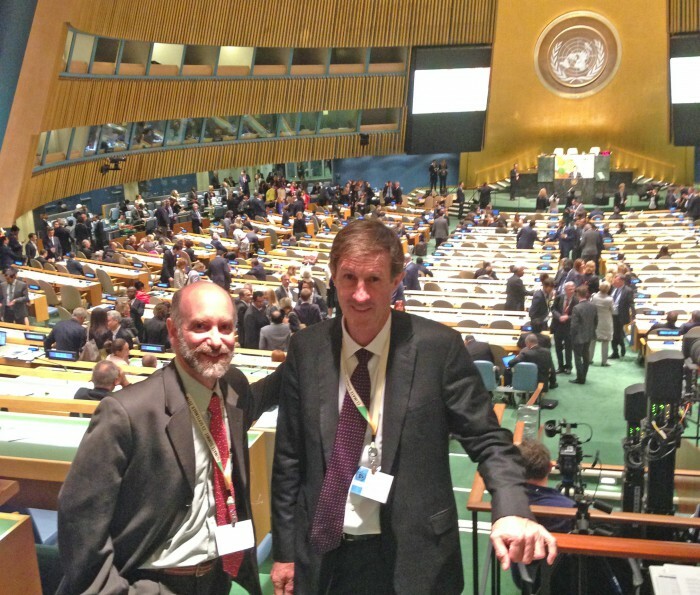 Entrepreneur and philanthropist John Holton, right, joined GHI Director Jonathan Patz at the U.N. Climate Summit in New York City. Internationally recognized for his work at the intersection of health and climate change, the University of Wisconsin-Madison’s Jonathan Patz says the new John P. Holton Chair in Health and the Environment will significantly advance this work. “In light of the current climate crisis and its impact on all aspects of health, John Holton’s gift is timely and will accelerate concerted cross-disciplinary work required to confront global environmental health challenges,” Patz says. The director of the UW-Madison Global Health Institute and professor in the Nelson Institute for Environmental Studies and Department of Population Health Sciences will hold the endowed chair. Holton is a successful health care entrepreneur and double Badger who appreciates that health is about more than medicine. “Good individual health care requires us to direct our attention to the many areas beyond diagnostic medicine, including the environment, food and water, physical activity, vaccinations and security,” says Holton (BA ’72, MS ’75). The Kenosha, Wis., native who studied history and industrial engineering at UW-Madison, founded Atwork Corporation and SCI to improve hospital efficiency in nursing, surgery, ambulatory clinics and revenue cycles. Atwork twice made Inc magazine’s list of the 500 fastest-growing private companies. “Dr. Patz is a world renowned leader in the study of the climate crisis and its effect on the health of the world’s population (and) is building a strong team that is focused on solving problems created by the climate crisis,” Holton says. 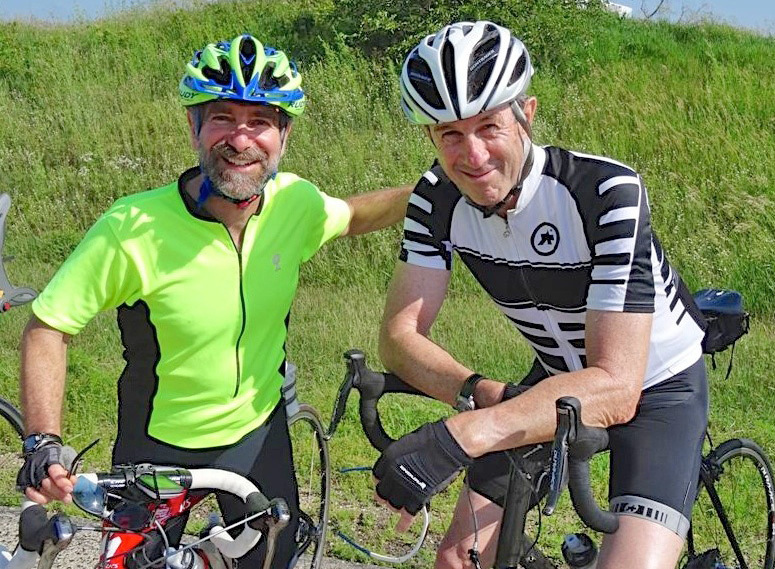 Bicycling is one of the loves entrepreneur John Holton, right, and GHI Director Jonathan Patz share. The synchronicity of the timing in Holton’s decision didn’t escape Patz, who has spent his first-ever sabbatical year working internationally on the climate change crisis and writing a book on the subject. Holton joined Patz in September 2014 for the United Nations Climate Summit in New York. Patz then spent the fall semester in Geneva, Switzerland, working with academic institutions and the World Health Organization (WHO) to prepare for the climate change negotiations this December in Paris. Patz also previously served for 15 years as a lead author for the United Nations Intergovernmental Panel on Climate Change, the organization that shared the 2007 Nobel Peace Prize. For spring semester, a Fulbright Award took Patz to Ethiopia, where UW-Madison has projects in medical training, climate change, nutrition and more. He has been based in Bahir Dar, which, like Madison, is a university town of about 300,000 on a large lake. A recently awarded USAID “Power Africa” grant, which Patz initiated, connects UW-Madison’s College of Engineering to Bahir Dar University. Patz is working with the Ethiopian principal investigator to add a women’s health component—linked to indoor air pollution from cooking—to the project. Patz, in collaboration with his Madison-based team, is also conducting research supporting urban planning for a “Bike-friendly Bahir Dar,” promoting healthy lifestyles for urban dwellers. “The fact that most of the world’s population lives in urban areas and that many of the largest cities in 2050 are still on the drawing board suggests that the Institute’s work in helping cities become healthy places to live should have a significant global impact on the quality of life,” says Holton, who also has supported the UW Livable Cities Initiative. Holton, with a matching gift from John and Tashia Morgridge, also established chairs in the Colleges of Letters and Science and Engineering. Posted in Health/Climate/Cities, Jonathan Patz, News, News - Home, Our People. Our Projects.